After the Holiday Season, many people tend to stay inside with the colder temperatures and winter like weather (maybe). The Downtown Bend Business Association is hoping to provide a fun scavenger hunt to get people out of the house and to Downtown! The event will run from January 7th- February 7th. It will be a partnership with Mount Bachelor and their ski groups for the season. Each store will have a passport in their location with a list of all participating stores. 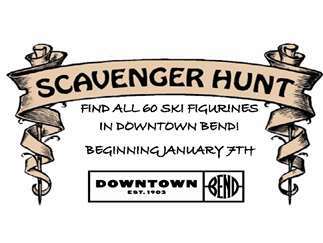 You pick up the passport, find the ski figurine in each store with the hashtag, #DowntownBendSkiHunt. If you post the picture with the hashtag you could be highlighted on the Downtown Bend Facebook page and Website. The DBBA is a nonprofit dedicated to increasing the vitality of Downtown Bend. For more information, or to make a donation, please email downtownbend@gmail.com.